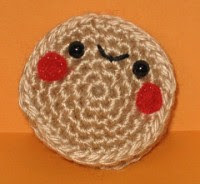 More amigurumi food from Ana Paula that you'll just want to eat right up! 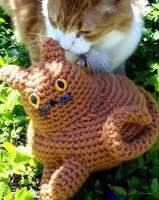 This free crochet pattern for "Fat Cat" is just so darn simple you just have to have a go. 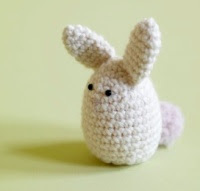 Grab the free pattern for this extremely cute chick asap, 'cause it'll be a huge hit anywhere, anytime. This cute bunny egg warmer will tickle the kidz no end on Easter Sunday, or just at breakfast on a cold Winter's morning. 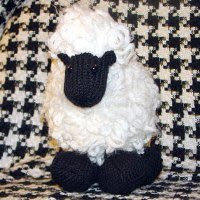 This knit sheep will be at home on any childs' farm. 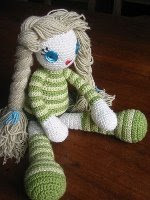 A more contemporary look for amigurumi, any girl would love "Boo". 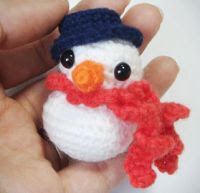 See how tiny this little snowman is? He'd be just perfect to hang from a branch of a Christmas tree, or to give as a gift. Won't be long and it'll be that time of year... again. 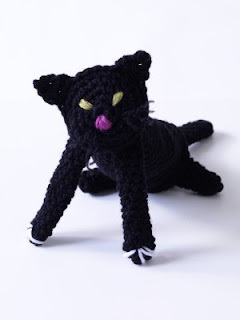 Get this black halloween cat crochet pattern free from the Lion Brands site. Remember, you'll have to sign up for free membership first. 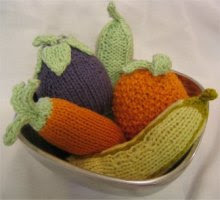 These patterns are suggested for use as babies rattles, but they'd make perfect play-food for any aged child. 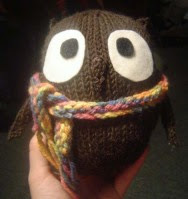 Edmund the Owl has such cute eyes, and his colourful scarf is a really nice touch. What better free amigurumi pattern for April than a cute raindrop in bright red galoshes? 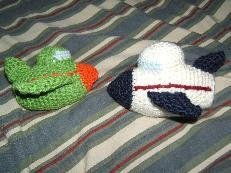 The left crochet plane is a WWII bomber, and the other a commercial airliner. Lovely presents for a baby boy. Aren't they the cutest things? 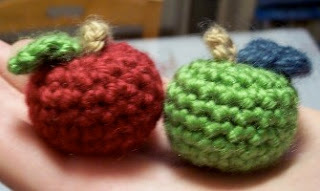 At less than 2 inches high, these apples are hardly a mouthful. 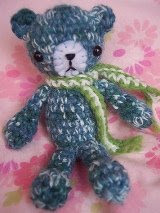 Depending on the yarn & hook size you use, you could crochet this tiny little teddy bear to be only 3 inches tall! 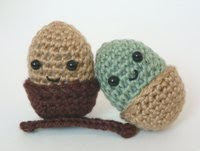 While you're there, take a look at Tatyana's other patterns on etsy. 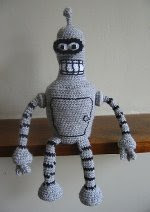 Bender, the cheeky robot from the TV series Futurama. A must for fans of the show. Very sweet little acorns, that you can whip up very quickly. 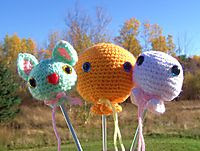 Gorgeous amigurumi balloons. Aren't they fun? You could decorate them with the birthday person's name & age, too! Is it just me, or does that one on the left look like a cat? 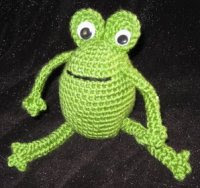 This stout fellow with the large bulbous eyes is a free pattern from Armina. 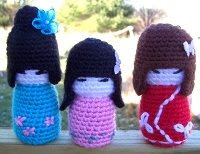 Wren is really into babushka dolls, so I'm sure these will be a great hit with her. 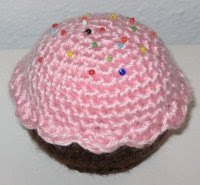 Get your teeth into amigurumi creation with this gorgeous crochet cupcake pattern. 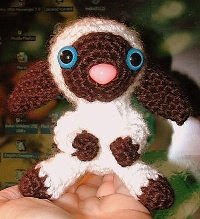 Another Easter Amigurumi creation, this time by me! 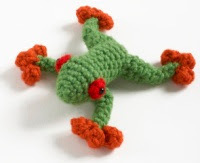 This is my first pattern & the kids loved taking these as gifts for their friends at school. 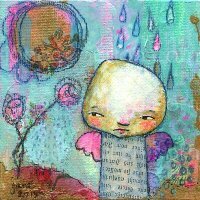 Another gorgeous mushroom from Katrina. I think this one must be Kiyoshi's girlfriend. Unfortunately, Katrina's website is no longer active. While the wayback machine has a copy of her site, the pattern files were in pdf format and stored with geocities (now defunct), and I've been unable to find copies of them. 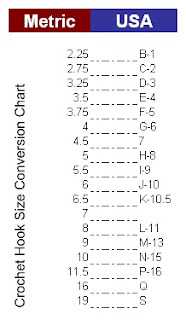 I've put together this nifty conversion chart to refer to when working with online patterns, because they always seem to be in the wrong type of sizing for me. Feel free to print it out and keep it someplace handy for reference. I love these! Those huge ears make them look like they're about to fall all over the place. 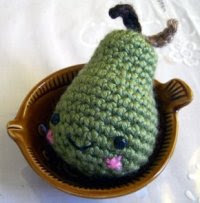 This adorable amigurumi pear has the sweetest little face, doesn't it? Yet another one I can't wait to try. Harry Potter fans can make their very own golden snitch with this free pattern! 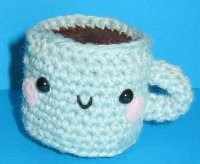 Okay, so it could be coffee, but I drink tea. Don't you just want to eat it right up? !